Matthew Pierce, MD, is a board-certified otolaryngologist in the Otolaryngology-Head and Neck Division at MedStar Washington Hospital Center and a member of the American Academy of Otolaryngology-Head and Neck Surgery. He sees patients for the diagnosis and treatment of all diseases of the ear, nose, and throat using nonsurgical medical treatments in addition to surgical intervention, when necessary. 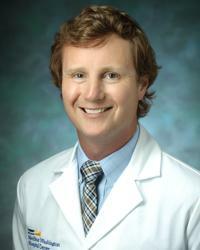 More specifically, Dr. Pierce is a head and neck cancer surgeon who is dedicated to the diagnosis and treatment of both benign and malignant tumors of the head and neck including the thyroid, parathyroid, salivary glands, oral cavity, and throat, in addition to skin cancers, such as melanoma and squamous cell cancer. Dr. Pierce is specialty-trained in robotic surgery and laser surgery for the removal of tumors of the head and neck as well as sialendoscopy, or endoscopy of the salivary ducts, for the removal of salivary gland stones. He also dedicates himself to the reconstruction of head and neck tissues following excision of head and neck tumors through the use of microvascular reconstructive surgery using free, local, and regional flaps. His clinical interests include all diseases of the salivary glands, including stones; and all cancers of the head and neck, including the thyroid, the parathyroid, and benign and malignant tumors of the salivary glands and submandibular glands. His research interests include improving access to and the efficiency of cancer treatment using a cancer care coordinator and increasing patient knowledge and awareness of head and neck cancer. He is also interested in exploring the role of human papillomavirus (HPV) associated with the development of head and neck cancers and how this information can change the way these cancers are diagnosed and treated. Dr. Pierce received his medical degree from the University of Texas Health Science Center at Houston. He then joined Georgetown University Hospital for a general surgery internship and a four-year residency training program in otolaryngology where he served as Administrative Chief and was awarded the Roy B. Sessions Award. Finally, he completed a specialty fellowship in head and neck oncologic surgery and microvascular reconstruction at Yale University before returning to MedStar. Dr. Pierce is an advocate for increasing robotics and laser treatments of head and neck tumors and implementing salivary endoscopy when appropriate to a wide population of patients in the Washington DC area at MedStar Washington Hospital Center. He has published various papers and has been invited to speak on numerous occasions domestically and internationally on topics surrounding issues of the efficacy of robotic surgery, head and neck complications of Streptococcus pneumonia, and snoring and sleep apnea in adults, among many other topics.